Just getting started on diapering your baby? You can learn the diapering skill easily but picking the right diaper for your baby is essential to keep your baby comfortable and fresh all day. Wondering if diapers are safe for your babies? The good news is that they are 100% safe and convenient to use during nights and while traveling. Nothing can be more blissful for a parent than to see her child sleep peacefully through the night. Placing a diaper pad inside your baby’s diaper helps to prevent the moisture from touching your baby’s bottom. It holds much more urine than a cloth nappy. Doublers can be used with cloth diaper inserts to offer extra absorbency in a pocket diaper. This product is designed to eliminate nighttime leaks. As it reduces discomfort and skin irritation caused by wetness, it promotes healthy sleeping habits in your child. It is perfect to be used during nap time and for long trips. Tested by dermatologist and pediatrician, it is 100% hypoallergenic and safe for your child. Its extra absorbency feature ensures that there is no need to wake up in the middle of the night for nighttime diaper changes. Its universal fit enables it to be used with most disposable diaper brands and sizes. Fragrance, latex, and chlorine free. Make sure that the pad doesn’t peep out from the diaper or there will be a leakage as the wetness absorbs mostly upwards. This pad is very soft has an absorbent layer that is covered with a very soft and thin layer of fabric. They are more convenient and practical to be used even if there is more outflow of urine. It can be used for both baby girl and boy. Bedwetting or medically nocturnal enuresis is a normal phenomenon. It is a part of growing up and can be managed in a better way so that it doesn’t affect any child psychologically. It is better not to get frustrated and take expert opinion as it takes time for a baby to overcome bedwetting. 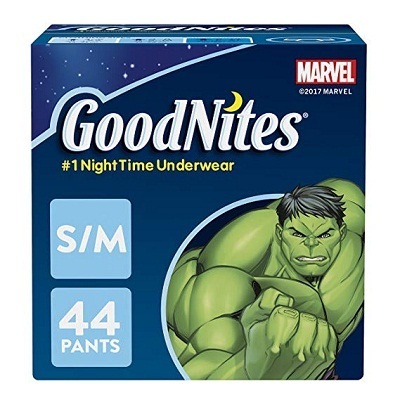 Bedwetting underwears are unique products that offer overnight diapers for toddlers so that they stay dry through the night. This bed wetting underwear for girls works like the most absorbent diaper. This underwear provides 40% more protection as against the training pant. It offers a superior fit for any body shape and sizes. Its double leg barrier and super stretchy sides help to prevent leaks and high-quality protection. It’s odor absorbing capacity is the best quality that helps your child to stay fresh all night. Overnight diapers are more expensive than normal daytime ones. Children who wear overnight underwear diapers take a longer time to be totally out of them, and they never feel the wetness during their sleep. It has an all-round underwear-like fit and looks very pretty with fun Disney designs on them. Available in extra small, small medium and extra-large sizes, they are the perfect night time companion for your child. 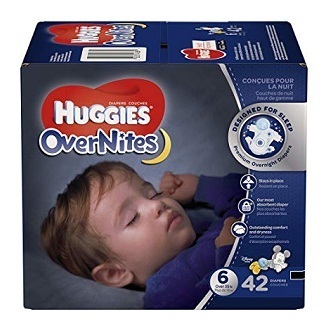 Huggies brings to you the best nighttime diapers that you can find in the market for baby care product. Your baby will be happy after a good night’s sleep in this diaper. 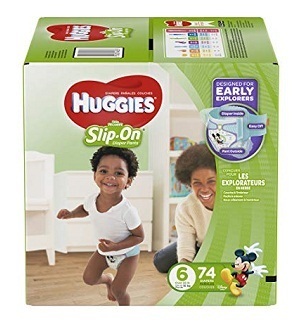 Huggies diapers guarantee faster absorbency with its embossed inner liner that removes moisture while its breathable outer cover keeps your baby dry and comfortable. Its double grip strips fasten at four points to ensure a snug fit while the stretchy waistband never lets the diaper move even if your baby tosses and turns during sleep. It’s leak-lock system locks in moisture and eliminates any nighttime leaks up to 12 hours. Its wetness stripe changes from yellow to blue to let you know when its time to change your baby’s diaper. You need to pick the right size, or there will be leakage. You do not have to disturb your sleeping baby to change the diaper. These diapers have adorable Disney designs on them that elevates your baby’s cuteness factor. Some babies are born with extra sensitive skin or sometimes can develop allergic reactions or skin problems when they wear diapers for a long time. Nighttime diapers need to be safe and effective as babies wear them for longer hours. These free and Clear diapers have an ultra-absorbent core to prevent leaks and are made with 0% chlorine bleaching. Instead of smelling like artificial fragrance, they have no lotions on them that may irritate a baby’s skin. Its high capacity ultra-absorbent core draws moisture and helps your baby feel dry and protected. Made from a soft quilted liner, it stays gentle and soft on your baby’s brand new and delicate skin. They are unbleached diapers that can be used for newborn babies to six-year-olds. 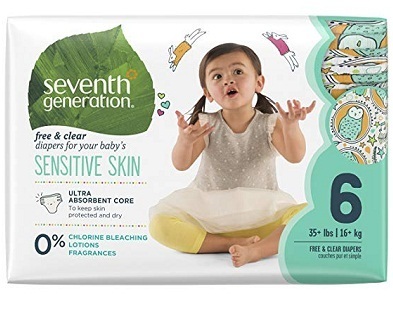 These diapers offer a comfortable baby living fit, and their reusable flexible tabs provide security and leak protection. Although it is recommended by the pediatrician, it is advisable to get dosing guidance and reminders for medication from your doctor. It comes with a travel case but does not have a cover for the tip. The best part of using Seventh Generation diaper is that it does not process its product using chlorine. Even the packaging for this diaper is made from 100% recyclable material that should bring a smile to those who think that diapers cause harm to our nature. It’s that time when your baby is growing up fast making a smooth transition from being a baby to a toddler. 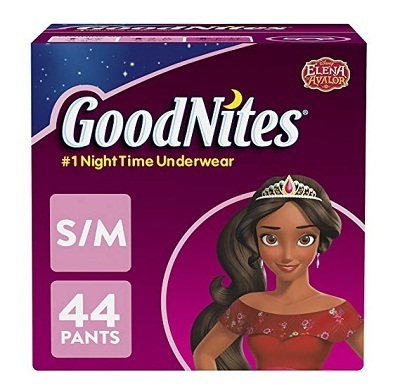 Nighttime diapers size 2 is what you should buy before your child gets potty trained completely. These diapers offer the best fit with a contoured shape for the fast-moving babies who enjoy their playtime. Its double grip strips secure the diaper twice on each side for a flexible fit that lasts longer hours when you’re travelling with a toddler. It’s unique wetness indicator changes color to inform you when to change the diaper. It has a dry touch liner that absorbs wetness at the time of contact while its leak-lock system protects up to 12 hours. These diapers are completely fragrance-free, lotion free and hypoallergenic. They are extremely gentle and delicate that enables your child to wear them for longer hours. It is designed with a size up indicator that assists parents to understand when it is required to move up to the next size diaper. Available only in size 3-6. It might delay potty training if your child gets used to wearing it most of the time. No matter how active your toddler is, the double grip strip offers a snug fit and keeps your baby’s diaper in place. 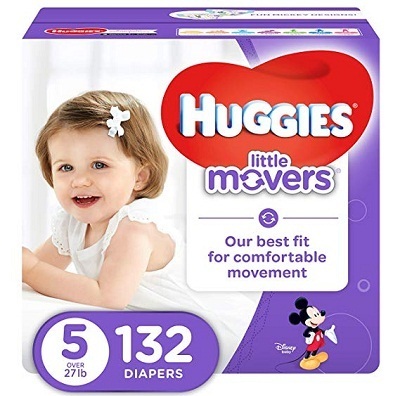 Make your toddler look cuter than ever with these Huggies overnight diapers size 3 that feature adorable Disney characters like Mickey Mouse and Minnie Mouse. Let your little toddler move faster wearing these diapers that offer 30% more flexibility than the other brands when wet. Choose a diaper that serves the dual purpose of what looks like a pant from outside, but works like a diaper from inside. Stock up your child’s daily essentials wardrobe with this diaper available from in different sizes that keeps your baby ready for an exploration of the immediate surroundings as well as prepared for travelling for long distance. Its pre-fasten design offers a slim trim fit. It also gives the versatility for changing while standing up or lying down. Its all-around stretch offers unlimited motion and freedom of comfort for your child while playing with their friends. Leak lock up to 12 hours of protection. Looks stylish and is most suitable for your active toddlers. The little orange tabs make them easy to wrap up and dispose of them when you need to. You can get them off like a normal diaper and not drag them down the legs. Will need an alternative night time diapering option. It might be a little expensive to use on a regular basis until your child gets potty trained. As this product is very trim, most often no sizing-up in pants are needed. Even the most inexperienced diaper changer can attend to a baby with this diaper for its easy on and off usage. Most daycares and nursery would accept them too if your child is already going to any of these places. Your bundle of joy is about to arrive in your home and keep you busy all the time by frequently passing urine or stool. 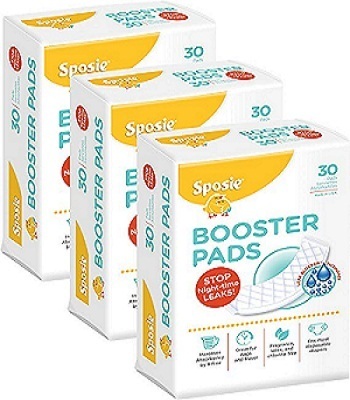 As a doting mother you want to do everything to keep your baby happy, and for that purpose, you mustn’t forget to buy the disposable overnight diapers size 1 that is a must-have for your infant. This disposable diaper is the first choice of all nurses, parents as well as hospitals. With its soft heart quilt, it offers 12 hours of complete protection while drawing moisture and keeping the mess away. It has a wetness indicator to indicate when it’s time to change the diaper. Now you can wrap up your baby in a diaper that’s 2x softer. Its outer cover is very soft for complete comfort. It has a special umbilical cord notch to protect your newborn’s belly with a perfectly contoured fit. It can be perfectly safe to be used for infants. You need to change diaper frequently to ensure that your baby does not develop rashes due to sensitive skin. It’s air channels distributes moisture evenly so that your child stays dry and comfortable up to 12 hours. 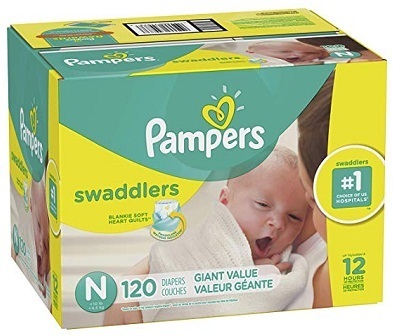 Pampers is a most trusted brand that doctors and mothers rely on for quality baby care products. Need a solution for your son bedwetting at night? This overnight diaper would keep his pyjamas dry and let him sleep without disturbance. The goal of this underwear is to provide 40% more protection than other leading training pants. Its superior quality ensures a better fit for different body shapes and sizes. It’s double leg barriers, and super stretchy sides help to prevent leakage even if there is increased urination at night. It’s 5 layer protection, and extra absorbency reduces doors and locks away wetness efficiently. As it is designed for 3 years and older, it is advisable to talk about the bed-wetting problem rather than feeling frustrated about it. Instead of getting over-dependent on using this underwear. Order this product without worrying as it manages your child’s bed-wetting problem like a pro. Your son will wake up fresh and ready to get on with his daytime activities without fussing if he has been using this underwear at night. It is essential to choose the right diaper that is needed for your child-daytime or nighttime use. Different age groups for using a diaper. Ease of use, comfort factor, and pricing. A newborn’s activities and needs may be limited as compared to a toddler. Hence, it is always advisable to pick the right diaper that suits your baby’s needs so that the journey of parenthood remains a happy memory that you cherish for a long time.